Hello, I have a very simple BP which triggers an event every 2 seconds. And that event gets the collision capsule rotation (yaw value) and substracts the control rotation(yaw value) from it. This results in an instant snap of capsule to rotation wanted. How can I make it so that capsule rotation rotates smoothly to the yaw value wanted? 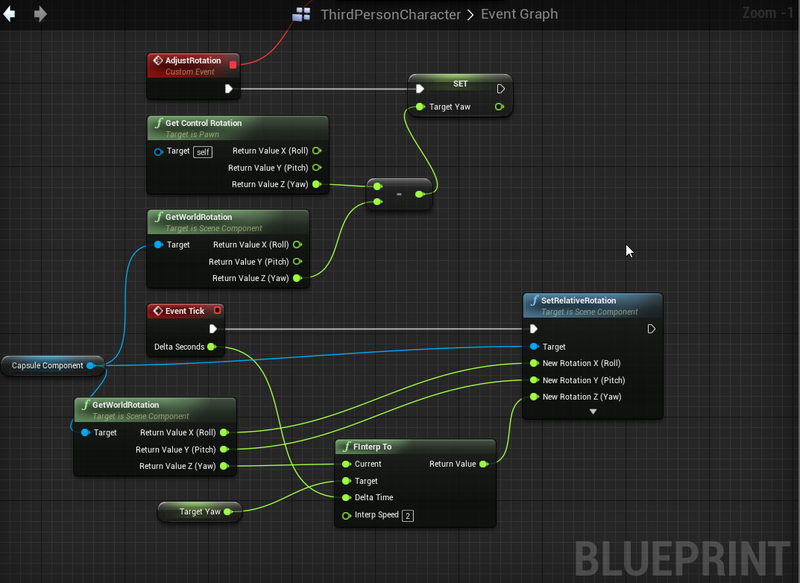 I tried using timeline, lerp and Rinterp to nodes but they didn't quite work or I did something wrong. Thank you for any suggestions/responses. The Problem is that you trigger only every 2 seconds. Instead of Rotating there do your rotation on Tick. In your Timer you can simply set a Float variable to hold the Yaw rotation you want and use that Variable in your tick. You can use interpolation for this. Hello Nachtmahr. Thank you for your prompt reply. I tried many ways but no help. what I might be doing wrong? Hi there Axe the Problem is the same you call it only every 2 seconds from the timer. You have to move your Code to tick. Interpolation and AddLocalRotation needs to be there. Hello back Nachtmahr. Moving the code (AddLocalRot and Interp) to tick made rotations smoother but it causes character to rotate with mouse every frame. What I have is character moves his head(Not the whole character) with the mouse. What I am trying to do is to rotate the whole character to the rotation of the control rotation (Head bone) every 2 Seconds so that is is more realistic. Please excuse my lack of experience in this game engine and coding. Thank you for answering my questions Nachtmahr. No Problem man here is a Screenshot of what you want. @Nachtmahr, Thank you man, it worked nicely. I very appreciate your help and support! Timer & Countdown: How to implement state of the art / best practice?